This is my tailless whip scorpion, Freddy. He’s a big sweetie, unless you’re an insect. In that case, he’s your worst nightmare. My first impression looking at this picture is that “this girl missing some serious screws lol”. However to each his own, you keep doing for as long as you enjoy it. You are awesome! I’m so happy I found your blog! 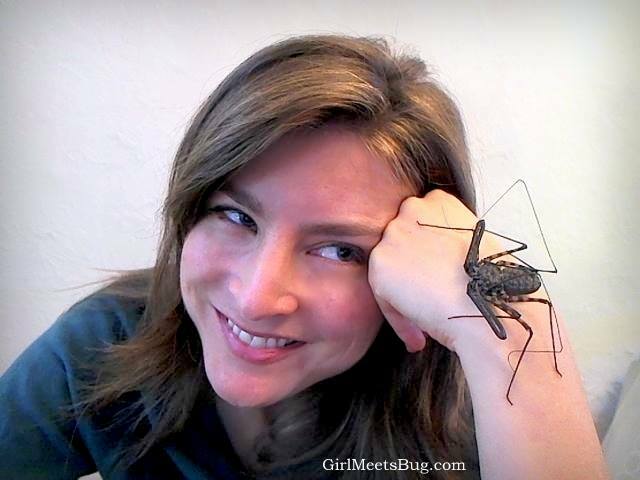 I am a budding lady-entomophagist and am hoping to start experimenting with edible arthropods after I get my mollusk farm up and running! This animal is absolutely adorable! I had it in my hand a few times only and I was surprised how gentle and delicate they really are, even though they look so “scary” to most people. And in my opinion, all your screws are in place (reaction to one of the previous comments) and I absolutely love your blog, in fact I came here in search of some recipe of how to cook my Zophobas morio larvae. I would love to get into entomophagy a bit more and my aim is to teach kids not to be afraid of invertebrates. So far big success with millipedes and snails 😀 Best of luck to you, I am a new follower and will keep coming back!!! Cool! I was hoping Freddy was a girl for some reason. Isn’t she?! I’m glad you think so! How long have you had Freddy? And if it is a scorpion won’t it sting you? I’ve had Freddy for about 3 years. Freddy is a tailless whip scorpion, so she has no stinger. She is completely harmless, unless you are a bug she wants to eat. In that case, watch out. I find them in my bathtub all the time. I never considered naming one, though I do pick them up and put them outside.